SlimCycle® | Official Site | Start Pedaling To A Slimmer, Thinner You! Start Pedaling To A Slimmer, Thinner You! THE EASY WAY TO A SLIMMER YOU! SlimCycle® makes exercising fun! It's so easy to use and comfortable you won't even know you're working out. LIKE HAVING 2 BIKES IN 1! Only SlimCycle® transforms from an upright position to a recumbent position so it's super comfortable! Struggling with the battle of the bulge? Going to the gym is time consuming and costs a fortune. Introducing SlimCycle®, the 2 for 1 fitness breakthrough that gives you 2x the results in half the time. It's so easy to use. 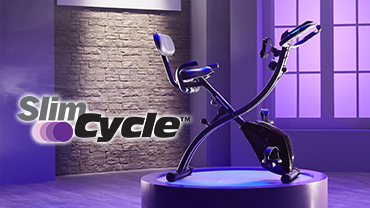 Just take a seat and start Pedaling away to a slimmer, thinning you in the comfort of your own home. READ FULL DESCRIPTION SlimCycle® is the one dynamic easy-to-use machine that combines a full cardio blast with arm resistance so you can sculpt lean muscle mass as you pedal to a leaner you. You simultaneously work on your cardio and upper body strength in a short amount of time. And only SlimCycle® transforms from an upright position (for an intense workout) to a recumbent position (for a relaxed workout), so it's as comfortable as sitting on your couch. It's like having two bikes in one! Ordinary stationary bike seats are small and hard. With 2.5-inches of superior cushion and memory foam backrest for support, SlimCycle® will be the most comfortable ride of your life. The seat adjusts to accommodate heights of 4'11" to 6'4" and holds up to 300-pounds. Thanks to its large opening and built in handle bars, getting one and off SlimCycle® is easy. Plus, there's 8 levels of magnetic resistance to turn up the intensity of your workout. Sculpt and tone your body in as little as 10 minutes a day. SlimCycle® is completely silent. Watch TV or talk on the phone while working out. It won't even disturb a sleeping baby. The large, easy-to-read digital display tracks your calories, distance, speed, and the odometer shows every mile you've ridden. You'll even be able to track how hard your working, thanks to the built-in heart monitor. When you're finished with your workout, SlimCycle® folds in half like an ironing board and easily wheels away to store in your closet or under your bed. Transform your body today! Get your SlimCycle® and transform your body with SlimCycle® for only 5 payments of $39.99. We'll also ship your order to you for FREE. We'll also include a library of 10 free on-demand virtual rides. Just download the FREE SlimCycle® app and follow along with our instructors! You'll also get the Slim Away belt with your order! Wear it to maximize your workout and burn calories fast. You can even wear it under your clothes for an instant slimmer, trimmer look. Order now! Slim Cycle does not ship to AK, HI, PR, Guam or Canada. Check out these other great products by SlimCycle. OFFER: Get your SlimCycle and transform your body for only 5 payments of $39.99 and FREE shipping and handling. We'll also include a library of 10 free on-demand virtual rides. Just download the FREE SlimCycle app and follow along with our instructors! But that's not all, you'll also get the Slim Away Belt to help you maximize your workout! Order now! GUARANTEE: Your satisfaction is 100% guaranteed. if you are dissatisfied with your SlimCycle for any reason, simply return the product within 30 days for an easy refund of your purchase price, excluding shipping and handling. See our return policy for more information. Exceptions may apply.